It's FRIDAY! Whoop whoop. I hope you have some particularly spectacular plans made for the next 72 hours. Sweet B and I have been discussing our weekend plans over some milk this AM. 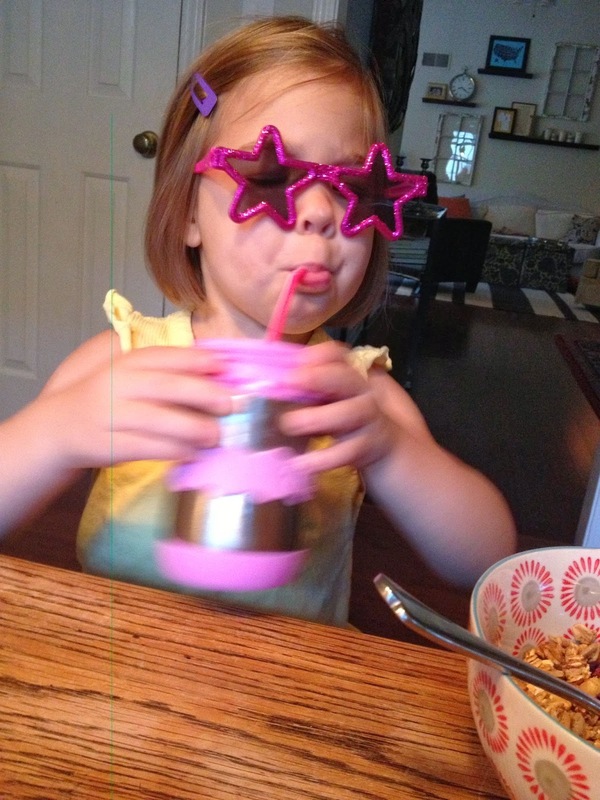 Sparkly pink star sunglasses help us up the awesomeness ante. I'll be man-less all day Saturday, and in the depth of my sorrow, the good Lord sent me no less than 2 party invitations for Saturday. That means I just have to pour cereal in the morning and then hopefully food + entertainment are taken care of for the rest of the day. In light of the great sacrifice I have made so B Daddy can go out and prove his manhood, I told him I would take the kids to church Sunday by myself (so he can make up for a bit of sleep loss) and then I would be leaving for the afternoon. By myself. Note to fellow wives: I did not choose the best time or manner in which to deliver this bit of information. Working on it. I'm thinking there's going to be a pedicure in there somewhere and a lunch that does not consist of a PB&J eaten standing up. What are your weekend plans? Last minute Halloween costume creation anyone? Anyone else rocking sparkly pink sunglasses at 7am? Happy Friday!